Mostly it's just egotistical nonsense inside a bland resume. But what works much better is to showcase who you are as an individual and how you help customers . 1) Get rid of the stuff that shows how great a salesperson you are. 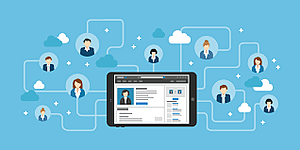 Most salespeople create a LinkedIn profile to target their next sales job rather than appealing to the buyers of the company they currently represent. This is a huge mistake that can easily be fixed. The biggest problems are when salespeople list things like “Chairman’s Club”, “Exceed Quota”, and other sales related qualifications on their LinkedIn instead of listing the things that will be important for customers. It’s like their LinkedIn is always optimized for finding a new sales job rather than helping buyers. Personally, I’m intimidated if I look at my salesperson’s LinkedIn and it says how they bring in tons of sales. It makes me think I’ll be taken advantage of. It’s much better to list things on LinkedIn about how you’re knowledgeable about the industry, that you’re an expert in what’s important to your buyers. 2) Write a headline that appeals to your buyers. 3) Consider writing your profile in the first person. Most profiles are written in the third person and as such don’t allow a buyer to warm up to the sales representative. Yes, it’s controversial but I suggest writing your profile in the first person instead. Experienced Sales Director with a demonstrated history of working in B2B technology industry. Strong experience in driving scalable improvement with customers in the auto industry. I have a passion for how technology can be used to build businesses. I work with auto industry executives to help them understand how to best apply complex technology. 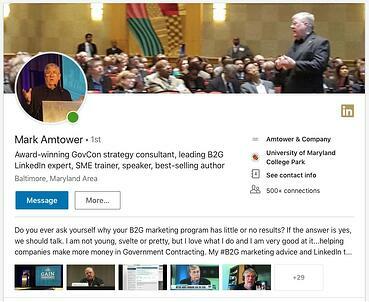 Do you ever ask yourself why your B2G marketing program has little or no results? If the answer is yes, we should talk. I am not young, svelte or pretty, but I love what I do and I am very good at it...helping companies make more money in Government Contracting. These are just a few suggestions for how to improve your profile. For more, take a look at the free report (no registration required) LinkedIn: 15 Ways to Rock Your Personal Brand published by Vengreso, a B2B sales training and services company. "Digital Engagement starts with the right brand to attract your targeted buyer,” says Mario Martinez Jr., CEO of Vengreso. “If a buyer has any level of remote interest in what you have to say, they will look you up. If they do, will they find a profile that showcases how amazing of a salesperson you are? Or one that serves as a buyers resource? Start digital engagement with ensuring you've got the right "fishing rod" to catch the fish that you want." It’s not about you. It’s about your buyers! Disclosure: I am an advisor to Vengreso.